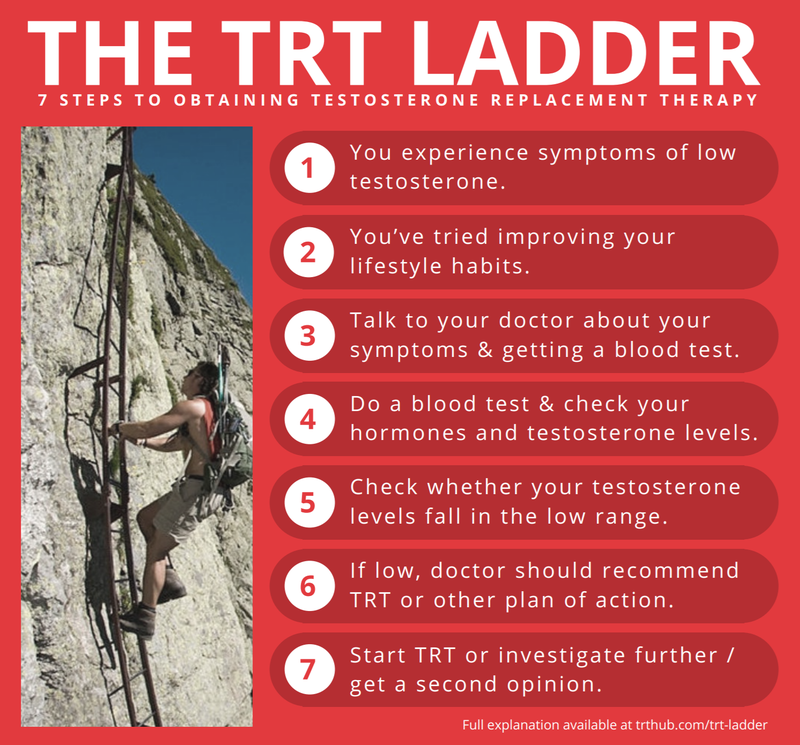 The TRT Ladder illustrates the process of getting Testosterone Replacement Therapy in seven very basic steps. This is a simplified breakdown of the process for absolute beginners. For those looking for a more involved explanation, please see the section below entitled “The TRT Ladder Explained”. You suspect you have low testosterone (also called hypogonadism) and may need testosterone replacement, but you don’t know where to start. No problem! The TRT Ladder should help give you a nudge in the right direction. The TRT Ladder lists the most common steps taken by the average man with low testosterone to obtain testosterone replacement therapy. This should be the first course of action most of you should follow if you’re new to the world of TRT and hormone replacement therapy. Most men discover TRT when they start looking into some of the symptoms they experience in general day-to-day life. These may include moodiness and anxiety, low energy and motivation, lack of confidence and self-esteem. Also, a decrease in general well-being, mood or enjoyment of life are typically reported. You may also experience the physical side effects, such as a decrease in libido, reduced frequency in morning erections and difficulty increasing strength, size and endurance. If you experience at least 2-3 or more of these symptoms, then you may have low testosterone. (See this page for a full breakdown of symptoms). For a lot of people, simply improving your general lifestyle habits can reduce or eliminate many of the symptoms mentioned above. Getting sufficient, good-quality sleep. So many people underestimate the power of this. It’s huge. Don’t cut corners here. Good nutrition and eating healthily. Regular exercise and maintaining a healthy weight (preferably some muscle too). Reducing your intake of toxins, such as alcohol, drugs, refined sugars etc. Talk to your doctor/medical practitioner about your symptoms and getting a blood test to check testosterone levels. Explain your symptoms and that you wish to have your hormones checked because you suspect you may have low testosterone. If they are a reasonable, open-minded doctor, then they should have no problem having these tests done for you. Usually, private doctors are a lot more open to this than public health doctors. However, with public health practitioners, you MAY encounter resistance. If your doctor refuses to do the tests, or suggests a different path of treatment (for example happy pills or painkillers etc), say no. There is no reason for them not to do the tests, other than bureaucracy or ignorance. Do not allow a doctor to prescribe you any drugs until you have at least had a look at your blood work. If they prescribe drugs without doing any blood work, then they are guessing. Be proactive and stand your ground. You are responsible for your own health, not your doctor. If your doctor is difficult, find another one that is willing to investigate properly. Step 4 – Do a blood test and check your Testosterone levels and other hormones. Ask your doctor to do a blood test and check Total and Free Testosterone. SHBG and Estrodial can (and probably should/would) also be tested. These are the main hormones that need to be taken into consideration when checking for low testosterone and recommending TRT. They all play a role in the balance and management of testosterone in your body. Once your blood test results have been done, check whether you fall below or close to the low end of the normal range for testosterone levels in healthy men. Most medical practitioners will use total testosterone as the unit of measurement. The free testosterone can also help give more information when total testosterone is low. They may also look at estrodial as a possible cause of your symptoms. Your testosterone may come back as in the low, normal or high range. NOTE: What is currently considered “low” and “normal” these days is a contentious subject and out of the scope of this article. However, you will find plenty of other discussions about this on this website, my YouTube channel and online. Step 6 – If low, your doctor should/may recommend TRT or plan of action. If your testosterone levels are declared low, your practitioner may recommend TRT, or another course of action based on your hormone blood test results. If you are fortunate enough to get a prescription, congratulations! Like I mentioned above, what is considered low and what is considered normal varies from person to person and lab to lab. Not to discourage you, but I’d rather you be prepared for reality – your levels may come back very close to the low and normal ranges, and you may be declined treatment because they consider you to be within the “normal” range. If this occurs, it may be frustrating, but don’t be discouraged. It’s actually quite a common situation. The last thing you want to do is throw your hands in the air and quit. Step 7 – Start TRT or investigate further / get a second opinion. Once you have your prescription for testosterone replacement therapy, begin treatment. You should notice a significant improvement in your symptoms and general well-being within weeks, sometimes even days. Continue to monitor your symptoms and blood levels with your medical practitioner over time, and make adjustments where necessary and advised. If you are unable to get treated or your doctor/medical practitioner is being difficult regarding treatment, get a second opinion and find a different medical practitioner. If you’re on public healthcare, you may decide to look for another doctor. Or, to increase your odds of getting a quality service and more accurate diagnosis, you may want to consider going private. TRT is a privilege, not a right. You are not entitled to it. So if you are able to get it for free on your public healthcare system, consider yourself very fortunate. Many men pay for their treatment, including me. The alternative of living untreated is unthinkable. If you have a genuine case of low testosterone, then you will absolutely appreciate the improvement in your life and well-being that TRT brings you. Best of luck on your journey. I hope it’s a simple one! If not, you have a community here to help you along the way. I am doing my best to build a network of resources to help men all over the word get treated as quickly and simply as possible. If this guide helped you get treatment, please get in touch and share your success story with me.